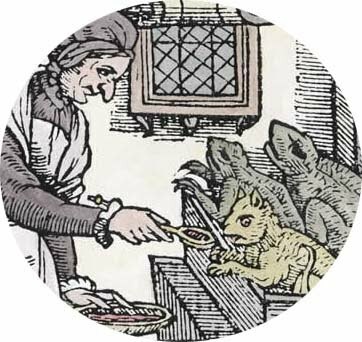 Detail of a witch feeding her familiars. 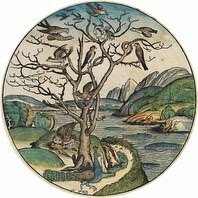 Woodcut, England, late sixteenth century. 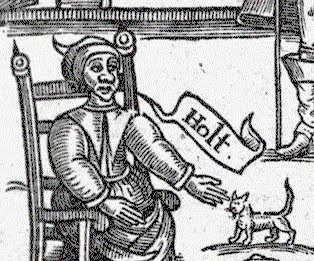 The frontispiece (see below) to the witch hunter Mathew Hopkins' infamous pamphlet The Discovery of Witches (London, 1647) is a classic image, and rightly so: few texts better evoke the strangeness of the early modern witch hunt. 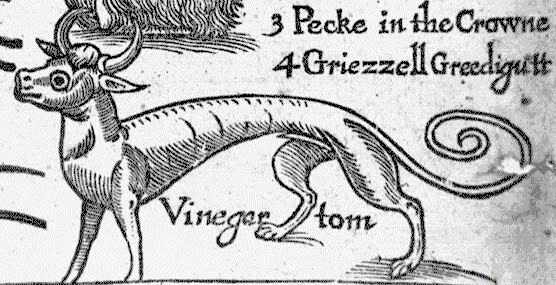 I suppose the author, publisher and artist expected their early modern readership to feel a chill when they gazed upon this crude woodcut depicting the moon-eyed familiars of a coven of witches that Hopkins claimed to have discovered in Essex, but to my modern eyes these little creatures are strangely endearing. 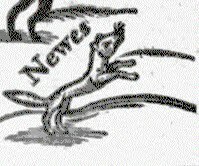 I'm especially fond of little Newes (see lower left corner), who, Hopkins noted briskly, was "like a Polcat." 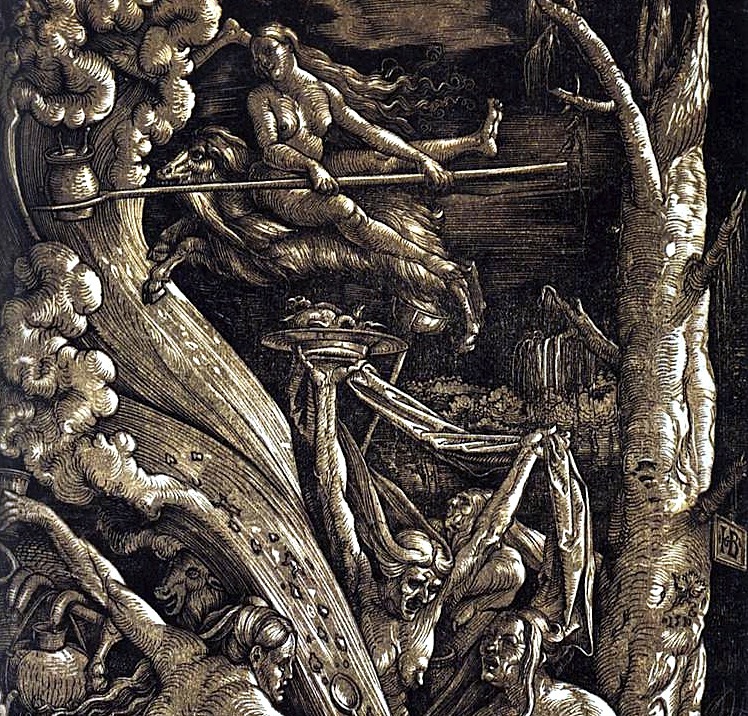 Detail of a witch riding a goat-familiar from Hans Baldung's 1510 woodcut "Witches' Sabbath." 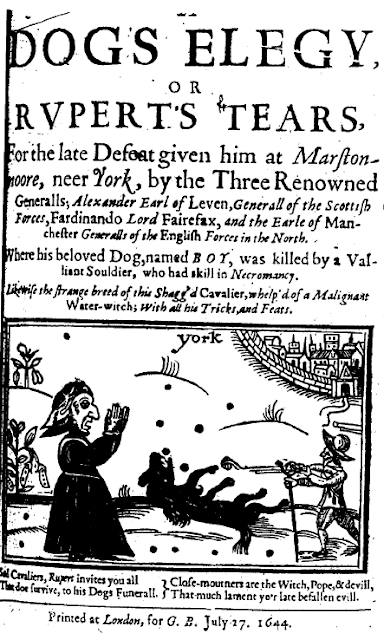 Observant readers will also note the final title line, in which it is revealed that Boy -- "the strange breed of this Shagg'd Cavalier" -- was in fact "whelp'd of a Malignant Water-Witch." It was said that Boy could catch bullets in his mouth, find hidden treasure and foretell the future, and his powers were so respected by his fellow Royalist soldiers that the dog was promoted to the rank of Sergeant-Major-General! 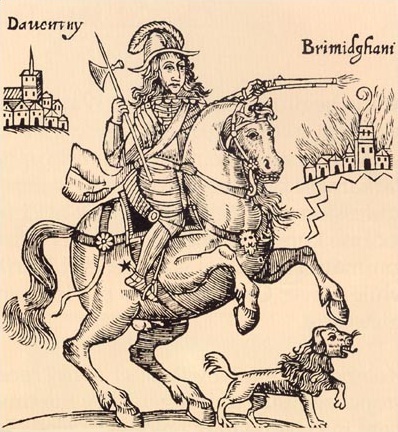 Another contemporary depiction of Prince Rupert and the witch-dog Boy, from the anti-Royalist pamphlet "The Cruel Practices of Prince Rupert" (London, 1643). For more see the Pepys Diary site's entry on Rupert. Brian Levack's The Witch-Hunt in Early Modern Europe is a good introduction to the subject of early modern witchcraft as a whole. 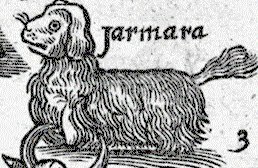 For more on the specific topic of familiars see this essay by James A. Serpell. Stuart Clark's Thinking with Demons brilliantly elucidates the ideologies behind the witch craze. 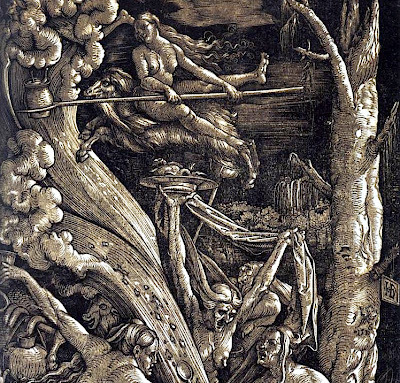 More works by Hans Baldung, the Dürer pupil who produced some of the most vivid and strange contemporary European depictions of sorcery, can be seen here. the witches. I would burn them all. It's terrible that "witch" has such a bad reputation associated with it. You've read "The Wise Child"? Juniper is such an endearing, beautiful, charming, sincere woman...who the townspeople want dead. 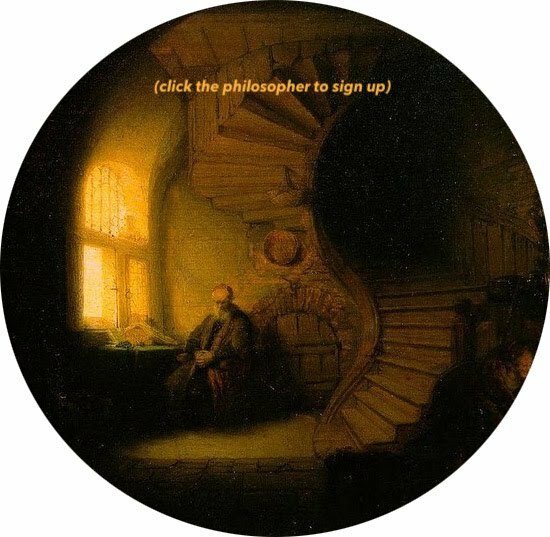 Thank you for this post, I have bookmarked The ebook you shared! Don't you wonder what really happened and what these people acturally saw. Just because a woman was a little different she was branded as a witch. By their standards, today we would all be considered witches. I've always loved that Woodcut of all the familiars ever since I first saw it in the partwork "The Unexplained". Newes is my favourite too - he looks incredibly cute. Especially that magician who could turn wine into water. Freak.